Take a bowl. Add flour and buttermilk and mix it well. Add salt, pepper, bell pepper and mix it well to make a thick batter. Add water if necessary. Take non-stick tawa and heat it. Add about ¼ teaspoon of oil and pour a ladleful of batter. Spread it evenly to make a pancake. Cook it on both sides till it turns light brown. 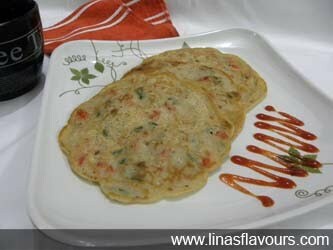 Serve it immediately with green chutney or tomato ketchup.